"I have always been an iPhone user, I am using the device since the launch of its first model. So, it was always clear to me, what kind of problems I could face as an iPhone user. Surely, the device is great but that does not mean that it wouldn't cause any problems. But when I was using the iPhone 7, suddenly my screen got stuck one day and it was a completely new situation for me as I had no idea how to fix a frozen iPhone." There are a lot of veteran iOS users out there who has no knowledge on how to solve the problem if an iPhone gets frozen. But don't need to get panicked as the article discusses several ways for frozen iPhone screen fix, below. If your iPhones got a frozen screen then you should restart the device, first. It is possible that restarting the device will fix the problem. Step 1: Press and hold the Power button of the iPhone for a few seconds. Step 2: Then, you will see the Slider on the screen. Step 3: Swipe it, to turn off the device. Step 4: Then, wait a few seconds and the press and Hold the Power button until the Apple Logo is visible on the screen. It is also possible that shutting down all the apps from your iOS device will fix the frozen screen. Here's how to fix a frozen iPhone by closing all the apps. Step 1: First, turn off the iPhone. Step 2: Then, just press and hold the Home button just for 5 seconds. Step 1: Tap and press the Power key and Volume Down key for at least 10 seconds. Step 2: You may see the Apple Logo but ignore it and keep holding it and you will see the start-up sequence. But this procedure will only be effective for iPhone 7 and 7 Plus. But if you are using iPhone 6 or earlier then use the following method. Step 1: Hold the Home and Power key together. Step 2: Wait for the Apple Logo and leave the buttons to initiate the start-up sequence. Step 1: Tap the Volume Up and Volume Down button one by one. Step 2: Tap and hold the Power button and wait for the Apple Logo. If any of the solutions above are not working for your device then the iOS must be damaged severely and that maybe the reason behind the frozen screen of your iPhone. Now, the only way to recover the device is to repair the iOS and Tenorshare ReiBoot is the best-suited software available for that. 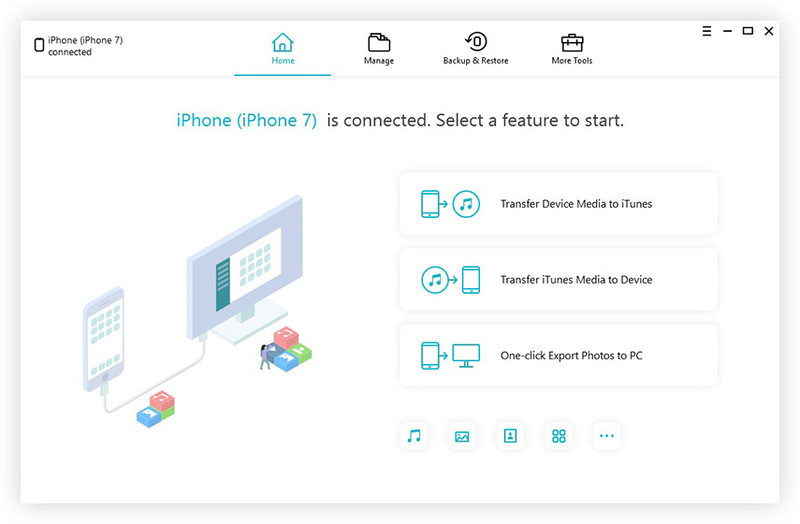 iOS Fix Tool ReiBoot is a third-party software developed by Tenorshare, it is capable of several tasks and iOS repair is one of them. Step 1: Now, install ReiBoot on your computer and then launch it. Connect iPhone to computer and choose "Repair Operating System" option when the device is detected. Step 4: After the firmware is downloaded you can click "Repair Now" to start the recovery process. This is the final option for you to fix the iPhone 7 frozen screen at home if a software issue was causing it. But if the issue was caused by some other reason then, it is probably a hardware issue so you need to take it to the nearest Apple Support Centre. A lot of iOS users face problems like frozen screen and it is very normal for them to get panicked; I would do that too if my iPhone is frozen and won't turn off. This article is specifically written for those desperate users who are looking for ways to fix their iPhones. No need to worry anymore, the article discusses various strategies to fix the problem with the iOS device, which includes Force Restart, Factory reset with iTunes etc. But one of the most satisfiable solutions is the use of Tenorshare ReiBoot to fix the iOS itself. Highly recommended!